When you get married, you are combining two separate lives into a relationship that now has common goals and purpose. It can be a difficult transition and one of the most difficult areas is the area of finances. 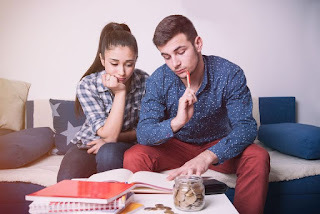 Most people do not look at financial compatibility when they start dating and so when it is time to combine finances it can be quite a shock. Here are ten financial mistakes you do not want to make as a newlywed. It is essential that you have both a budget and a long-term plan. Your long-term plan should include goals for retirement, home ownership and starting a family. It is important that you sit down and talk about this before you get married. A basic talk about what your goals are and a flexible timeline can make it so much easier to get on the same page when it comes to your budget and other issues that you may face. Sit down and create a financial plan before you get married, and a monthly budget that will go into place as soon as you get married. A huge mistake is walking into your marriage blind. This means that you never have the discussion about what your goals are, or what financial skeletons might be hiding. After you get engaged, you need to have a frank discussion where you lay it all out. This talk should cover the current amount of savings, the current amount of debt, any delinquent debts, bankruptcies other financial obligations that each person may have. This may be a make it or break it talk when it comes to the relationship, but it is important to address before you combine finances and end up with huge legal issues. You should not make it a habit to lie to your spouse about anything when it comes to finances. People often joke about hiding the shopping bags before their spouse gets home, but it can lead to serious financial issues in a relationship. Be sure that you are both upfront, when it comes to finances and that you are totally open about your current financial situation. If something feels off when you have the money talk, you should take this as a warning sign and seek counseling before you get married. There are a lot of reasons that you should wait to combine finances until you are married. The laws are set to protect married couples and if you are just living together, you may run into issues if you purchase a home together or take on each other’s debt. If you are living together before you get married, you should use a household budget where you both contribute to shared expenses. This protects both of you and helps you to share expenses in a fair way. It is essential to have a plan. If you plan on paying off your spouse’s debts so that you have a clean playing field, then you should wait until you are married to do this. You do not want to start your life together by creating a lot of debt. This means that you need to pay cash for your wedding and honeymoon. Although this may mean cutting back on some of the things you want, it will be worth it to not have the payments hanging around for months or years after you are married. By shopping for deals and planning ahead, you should still be able to create a beautiful wedding on your budget. You can also find great deals on honeymoon trips if you plan ahead. Take the time to really look for the best deals so that you have a great trip without going broke. A budget is your biggest key to being financially successful. It does not matter how much you make if you do not have a plan that helps you with spending it. If you are not willing to sit down and create a budget together, you will not be successful financially. It is important that there is give and take when it comes to things that each partner in the relationship feels is important. One person should not be doling out an allowance or micromanaging the budget. Instead, you need to be working together to make a plan that works for you. If this is proving difficult, attending a financial planning class can help you as you work on it. There are very few valid reasons for keeping your finances separate after you are married. If there have been issues like gambling or severe overspending, you may need to work on building trust between each other through a household budget. Otherwise, you should be budgeting all of your money together and working toward shared goals. This means that there are no hidden savings accounts or credit cards. You need to sit down with each other on a regular basis and make sure you are reaching your goals.If your spouse will not combine finances, they may be hiding a bigger issue. There are warning signs that you need to watch for before you get married. These are things that can really end up damaging you financially if you end up getting divorced. When you have your talk, you need to watch for things like a lower than expected income based on current spending habits, an unwillingness to sit down and talk about finances, and a poor credit report due to late payments or defaulted loans. People make mistakes and if your partner has been working on fixing past mistakes, you should not hold them against him. However, if there is no sign of change or even a realization that there needs to be changed, this should be a red flag. Getting married means that you must become a team. This means compromise. It means making sacrifices, and it means putting each other’s needs first. When you first get married, it may simply mean that you both have a set amount of free money to spend on what you like while you are working toward your goals. One person may handle the daily finances and paying the bills, but both of you should be in the budget meetings and discussing the spending each week. Both of you should be entering in your daily purchases. You should not hide spending from each other. The best time to deal with your debt is right now when you are first married. It is easier to take care of it before you take on the added expenses of owning a home or before you start having children. You have more disposable income when you are first married, and you can really use that money to start tackling your debt. When you are out of debt, you can focus your money on saving up for a down payment for a house. You can take the dream vacations that you want and enjoy yourself. It makes it easier to save for your children’s education and to provide them with the things that they need. Take the time now to get out of debt.